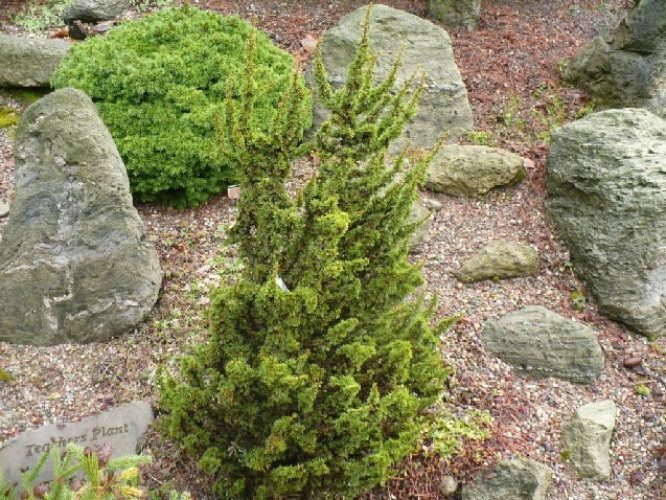 Coenosium Gardens: This little gem originated with Gordon Haddow, a well known Scottish conifer collector at Kenwith Castle Nursery. It develops into an upright, tiny little tree/bush. It grows a little over 1 inch (.5 cm) per year here in the Northwest where other Cedrus grow over 18 inches (40 cm) per year. It is a great plant for the rock garden or trough garden or anyplace in zone 7b or warmer that a miniature plant is desired. Cedrus brevifolia 'Kenwith' Photo taken at Coenosium Gardens, Eatonville, WA and donated by Will Fletcher.